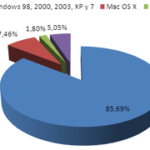 You can run 64-bit Linux or Windows but many drivers aer not there yet. If we are talking about servers then its probably not a problem, and if your server has 64-bit hardware then you should be running a 64-bit OS; but for the desktop thinks like Adobe Flash and man video and audio codecs aren’t here yet. While on the whole I’m happy with my 17″ Compaq X6050 (I wish it were lighter, though!) it and my tower server both have this limit on the number of slots for RAM. The thing here is that I want a large screen and disk, this is a ‘desktop replacement’. Yes, there are plenty of small and light machines out there. The Asus EEE PC come in at under a kilogram but it has 7″ TFT LCD with LED backlight @ 800×480. It is is a subnotebook, about the size of a hardback book. That’s great, as a ‘pocket book’, if you work that way. But I’ll stick with paper and pen or my trusty old Newton. When I want a computer I want a proper computer, and that means a proper display. Perhaps one day we will have display that are ‘smart paper’ and can unfold. This limit on memory represents some serous brain damage on the part of the designers. retailers don’t care that the loonie is stronger than the greenback I can get a 1 gigabyte DDR2 for C$29.99 on the high-street with no shopping around. The same for my laptop is a little over twice the price at the same outlet. If I got down to the Computer Strip at College and Spadina in Toronto I can find 512M DDR2 for C$12. When memory and address space was expensive we had to be parsimonious and ended up with virtual memory (and other) systems. We also had the phrase “virtual memory means virtual performance“. The “56k limit” of DOS running on an 8088 (or a Z-80 if you remember CP/M) and roll-in-roll out memory management fitted in with the economics back then. Even if you were willing to shell out for more memory the hardware wouldn’t support it, the chips simply couldn’t address it. So what has changed? Well the chips can address it, but if I were to shell out for 16 gigabytes of memory … the hardware won’t support it. The motherboards don’t have enough slots. Well, sort of. In one sense motherbaords are just another commodity, but that also means most of the are clustered in capability and performacne. Oh, there are exceptions! Here’s a “monster truck” that supports 16Gbytes of RAM. And you can add to that whatever memory is on the video card. Great for your server; great for your desktop. But what about the laptop? And lets not forget that more and more individuals and corporations are moving to laptops. The lure of mobility, of wireless networking, of telecomuting and much else is very strong. I suppose this might be yet another example of the “failure of imagination” syndrome that has always beset this and other industries, the designers and policy wonks simply can’t imagine why anyone would want to do “THAT!” It seems only time and a slow evolution of the marketplace brings about change. But what we have here is, as this article describes, an economic force. I can easily afford to buy large disks and large amounts of memory, more than my cabinet and motherboard can cope with. While I can always run a SCSI cable to another chassis, there is really no simple way I can add more memory than the motherboard has slots for. And with the laptop I am even more constrained. More and more applications are using large memory spaces. Perhaps applications will drive development of hardware. Consider these statistics. Half of the machines are 2G or more. When the hardware developers will be able to tout more slots as a way to sell more gear, it will happen. Even so, it may well be an iterative a re-run of the old 1950s attitude towards automobiles:- planned obsolescence. Many people think so, but items that last tend to become cultural icons – classic automobiles and of course the Newton.